Continuing on to my trip to SoCal months and months ago… I had such a blast. It was my first road trip with just my dad and it was pretty fun. We didn’t have the greatest relationship when I was younger. But now that I’m older, and somewhat wiser, we can bond. Do things together. Eat. Talk. And just… bond. You know… that kind of deal. 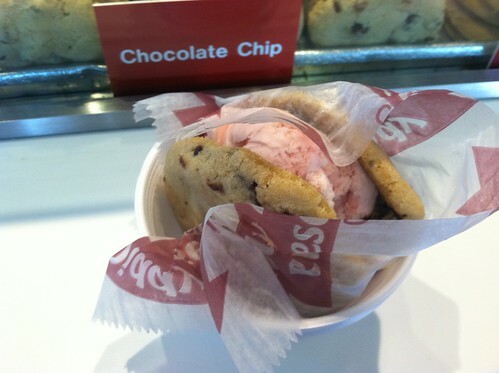 This entry was posted in Food Reviews and tagged chocolate chip cookies, cookies, ice cream, los angeles, reviews, strawberries on January 19, 2012 by Krystal. This past weekend, I took another trip to Las Vegas. There was lots of fun to be had. Family came because we were there for a wedding. It was an intimate wedding with close friends and immediate family. I enjoyed it. But I’m not here to talk about the wedding; I’m here to discuss the food that I ate while I was in Vegas. First stop: Serendipity of course! When we first landed, we were starving. I instantly said we should eat at Serendipity. I swear, they have the best french fries and deep-fried oreos. I would have ordered the deep-fried oreo sundae again, but we agreed that we should try something different. This time, we ordered the Jackpot Sundae (or so I think it’s called). It is basically dark chocolate ice cream and strawberry ice cream with strawberry and chocolate syrup, strawberries, and whipped cream. I enjoyed this sundae very much, but it was quite rich and we weren’t able to finish it all. I’m sorry jackpot sundae, but you made us full to quickly. I wanted to go here when I visited Vegas back in March, but we just didn’t have enough time to walk all the way down to Planet Hollywood for these dogs. This time, since we stayed in a closer hotel, we were able to enjoy the beauty that is Pink’s. I ordered the chili dog, since it was the most popular one. It was also my first time having a hot dog with chili on it too. That was a mistake. I found out that I am not a big fan of chili. So while the hot dog was delicious, the chili on top was not (to me at least). 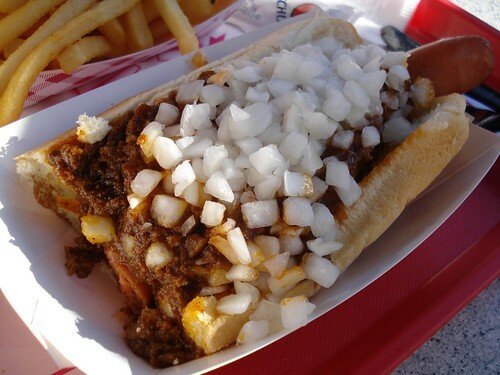 Next time I come here, I am ordering what I am familiar with… just a plain hot dog. 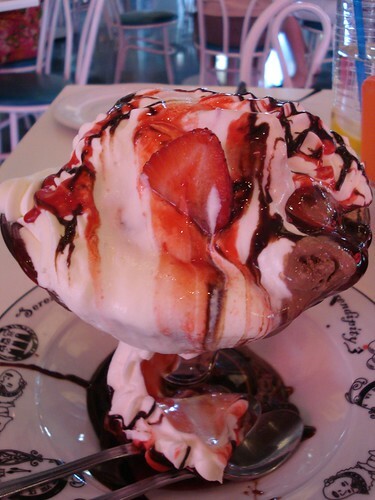 This entry was posted in Food Reviews and tagged chocolate, desserts, food, hot dogs, ice cream, las vegas, reviews, strawberries, sundaes on June 14, 2011 by Krystal. Ah, Fenton’s. I enjoy the atmosphere there for the little time I spent getting my ice cream to-go when I blogged about it here a couple months ago. I wanted to stay and eat there so badly, but was so frustrated with how tough it was to find parking. Now I had an excuse to go back there, and I certainly did… for W-‘s birthday a couple weeks after that! I planned a whole day for us and going to Fenton’s for lunch was one of them. We went earlier this time so it would be easier to find parking. We got wonderful booth seats and the place was practically empty around 11am. The service is great too. If you never ate there before, the waiter would most definitely tell you about their foods. Yum, their meals are so delicious! You would think that since it is a creamery that the food would taste horrible, but nope. It’s quite up there on my list. This entry was posted in Food Reviews and tagged chicken, chocolate, creameries, ice cream, oakland, reviews, sandwiches, strawberries, sundaes, vanilla on May 12, 2011 by Krystal. Fenton’s Creamery – the ice cream of Up! My brother came to visit us during his spring break from college. We hung out. Had some Ben and Jerry’s and chatted. It was all good fun. Then the topic of Fenton’s came up very briefly, but it lingered in my mind for quite some time. This entry was posted in Food Reviews and tagged chocolate, creameries, ice cream, oakland, reviews, vanilla on March 28, 2011 by Krystal.